Members of the Free Kieron Bryan campaign will hand over a petition signed by 1,400 journalists to the Russian Embassy tomorrow following a two-hour long silent protest. Bryan was arrested while covering a Greenpeace protest in the Arctic Circle after Russian special forces stormed the vessel he was aboard. Kieron’s brother Russell said: “Thank you again to the 1,400 of you who have signed the petition asking for the immediate release of Kieron Bryan. “In a show of solidarity for Kieron we will be holding a silent protest with his fellow journalists, between 12 noon and 2pm, tomorrow Saturday 2nd November, outside the Russian Embassy, W8 4PQ. “We are specifically looking to rally those who work in the media and care about documenting events, but all Kieron's supporters are welcome. We will be presenting the petition you signed to the Russian Embassy at the end of the protest. “Kieron, a freelance videographer, is still facing a seven year prison sentence under charges of hooliganism in Russia after documenting a Greenpeace protest in the Arctic. He has now spent 40 days in a Russian cell. This is a terrible injustice. It is absolutely vital that the Russians understand that Kieron is a freelance journalist, not an activist and certainly not a hooligan. Greenpeace International executive director Kumi Naidoo said: "As things stand the Russian authorities propose to jail 30 men and women because two peaceful protesters tried to hang a small yellow banner from the side of a 500,000 tonne oil platform. "First this saga shocked people across the world, now it has descended into farce. Those campaigners were willing to risk their liberty to shine a light on dangerous Arctic oil drilling, but the authorities' reaction has been wildly disproportionate. "The legal hammer now being wielded against them says so much more about those who have brought these charges than it does about the prisoners. They are neither pirates nor hooligans, they are simply people possessed of a conscience who care about our common future and they should be released immediately. "Once the charge of piracy is withdrawn, by law the detainees should be immediately released. This is because international law prohibits one country from seizing another country's vessels in international waters, except in the most extreme cases, such as piracy. Allowing states to seize each other's vessels for lesser trumped up charges would be a major threat to international relations and commerce." It is understood Kieron and his fellow detainees are being moved from Murmansk to St Petersburg. "The detainees shouldn't be in jail at all, they should be free to join their families and to restart their lives. "St Petersburg has some daylight in the winter months, unlike Murmansk, and families and consular officials will now find it easier to visit the 30. "But there is no guarantee that conditions inside the new detention centre will be any better than in Murmansk. In fact, they could be worse. 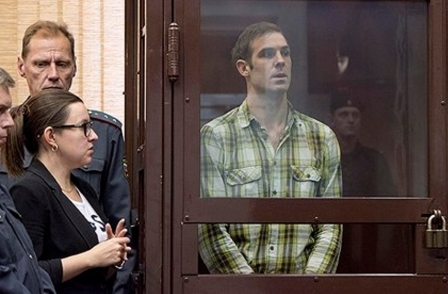 "There is no justification whatsoever to keep the Arctic 30 in any prison for a day longer. They are prisoners of conscience who acted out of a determination to protect us all, and they should be free."